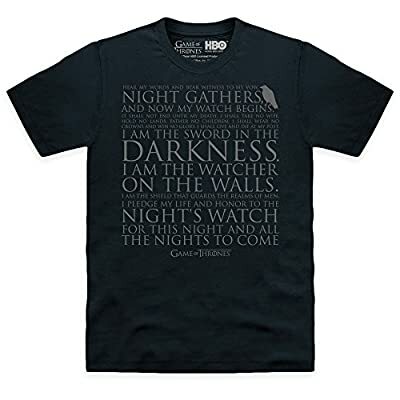 Promote the Night's Watch famous oath - also known as 'taking the black'.This is an officially licensed product. T-shirt design reads: Hear my words and bear witness to my vow. Night gathers, and now my watch begins. It shall not end until my death. I shall take no wife, hold no lands, father no children. I shall wear no crowns and win no glory. I shall live and die at my post. I am the sword in the darkness. I am the watcher on the walls. I am ... the shield that guards the realms of men. I pledge my life and honor to the Night's Watch, for this night and all the nights to come, Game of Thrones Our crew neck, short sleeved men's t shirts are 100% premium cotton in a soft pre-shrunk jersey knit. Our women's t shirts are lighter weight 150g tees made with deluxe 30's soft style yarns for a soft feel.